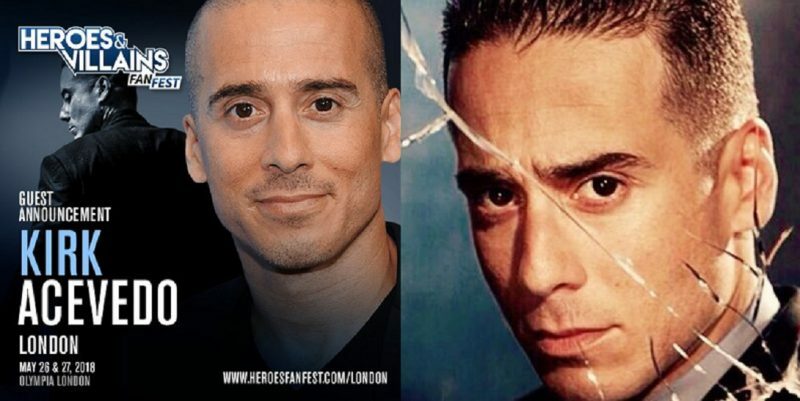 Kirk Acevedo is what I’ve always considered “An actor’s actor.” His résumé reads like a wish-list of TV shows to work on; from series like Oz, Band Of Brothers, Fringe, and 12 Monkeys, to movies like The Thin Red Line, and Dawn Of The Planet Of The Apes. As a long-time fan of his work, I was understandably overjoyed when I heard that he’d been cast as Ricardo Díaz/Richard Dragon in Arrow. As is often the case with the actors that play the most despicable of villains on screen, in real life Kirk is a really nice guy. He’s laid back, approachable and greets his fans with warmth and sensitivity. I had the extreme good fortune of attending the amazing Heroes & Villains Fan Fest for the second time back in May. To put a cherry on this already delicious cake, I was lucky enough to speak with him about playing one of DC Comics’ most enigmatic and secretly awesome characters. Steve J. Ray: Good morning, and welcome to London. It’s so great to have you here. 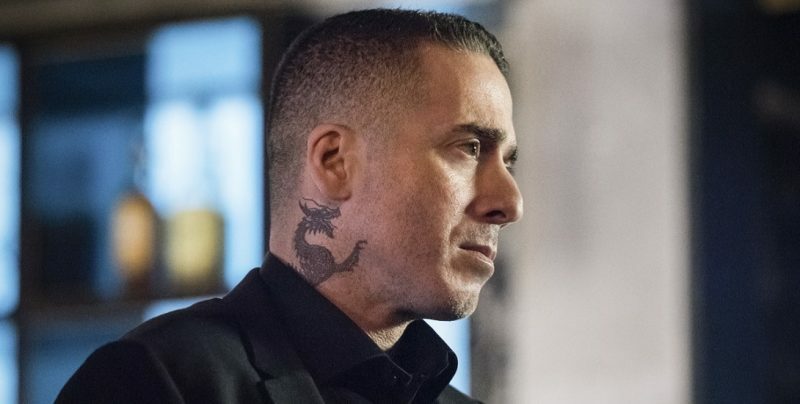 Kirk Acevedo: Thanks. It’s sort of a homecoming… I lived here a while back, working on Band Of Brothers. SJR: What a show that was! I followed you there and on Fringe, so was very happy when they cast you in Arrow. KA: Thanks, man. That’s good to know. SJR: Arrow’s a show that’s often watched “With the boys” pizza, drinks, etc… I’m a huge comics fan, but not all my friends are. When I heard the name Ricardo Díaz, I lost my $#!+ and punched the air. My buddies thought I’d lost my mind. KA: Yeah, he’s a big deal in the comics. SJR: Yes. He’s also known as Richard Dragon, and is one of the greatest fighters in the DC Universe. KA: Yeah. I learned more about the character when I got the part. Fighter, martial artist, one of the guys who trained Batman in the martial arts. SJR: Yes! So you’ve answered one of my questions, you clearly researched the character. It’s also quite clear that you had a fair amount of hand-to-hand combat training too. That fight between you and Stephen Amell was awesome! I have a fairly good eye, and to me it looked like that fight was almost all you guys. KA: Thanks, man. Yeah. We have the best stunt team on this show, those guys are incredible. I can’t say that was all us, but I will say that it was a good 80%. That scene took about eight hours to do. It was our first fight scene, so Stephen was very gracious. I didn’t get hit, which was great because, a lot of times, you know, you work with some actors and sometimes you get hit by accident… or not accident (laughs). He was a gentleman, and it was fun stuff. SJR: Diaz is a dangerous character. How much fun is that to play? KA: I love playing the villain. It’s so good being bad, we don’t have to apologise. I can kill a couple of people, and not go to jail in real life. You get to do something and don’t get into trouble for it and just have fun. The hero is boring, there’s not many layers to him, there’s more layers to the villain, Y’know. It’s grey, it’s not black and white. You are who you are for a reason. It’s more complicated than just being bad. SJR: And you’re only “Bad” to those on the outside looking in, right? From the character’s perspective you probably feel entirely justified. SJR: But how do get into that mindset, that frame of mind. I’m talking to you, and you’re clearly light years away from Díaz. KA: Thanks, man. It’s a lot of work, but sometimes it’s not all acting. SJR: How do you mean? KA: You’ve seen the dragon tattoo on the back? SJR: Yeah. It’s really cool. KA: (Laughs) Yeah, it’s not really cool, sitting in make up at a ridiculous hour in the morning, waiting three hours to put that thing on me. Sometimes after make-up I can really feel myself become a villain. SJR: (Laughing) Yeah, I bet! Us fans on our comfy sofas don’t really think about things like that. KA: Don’t forget it (laughs). No, it’s great. It makes playing the villain so much easier. Because, if I’m in a bad mood… Oh, I’m gonna have a good scene. So I just use that. KA: You know about the Dragon and the Hunters, right? SJR: Thanks, Kirk. It’s been great talking to you. Enjoy the rest of your stay and I can’t wait for season 7! KA: You’re welcome. It’s gonna get even better. We were queuing to ask a question at a panel, and the lady in front of me asked it first? I INVENTED THAT QUESTION! Once they’d answered, I tapped her on the shoulder and said, “Hey… That’s mine. I created that!” She looked me dead in the face, screamed “OhMyGodIt’sYOU!” turned bright red, and ran away. In the interest of diplomacy, I will thank that fan. In the interest of fairness, I will publish Kirk’s answer. Fan: So. You’ve probably been asked tons of questions. Is there a question you’ve always wanted to be asked, but never were? What’s that question, and what’s the answer? KA: Um… What do I look like naked? Josh Segarra: (Laughing) And what’s the answer? KA: (Tongue firmly in cheek) Really good. Thanks again to Mr. Acevedo for taking the time to chat. Be sure to check out my other interviews and coverage from the event, here on DC World, in the days to come!